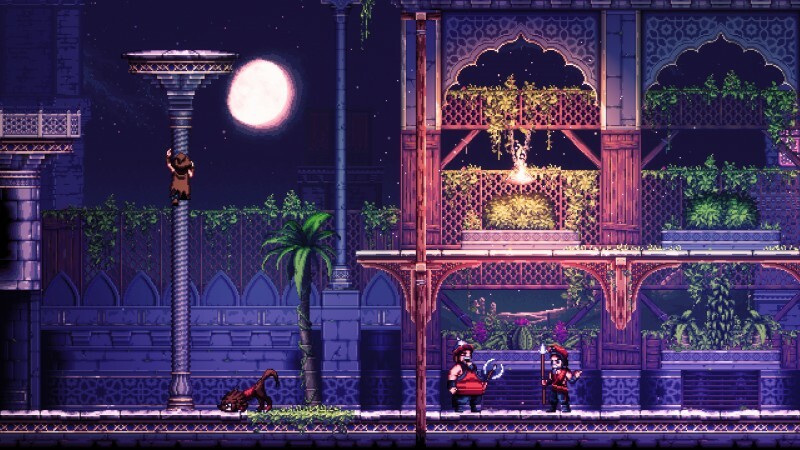 The game is a treat to look at; its ancient Arabian aesthetic with dusty caverns and gorgeous desert vistas peeking through ornate palace exteriors are drawn in meticulously detailed pixel art. 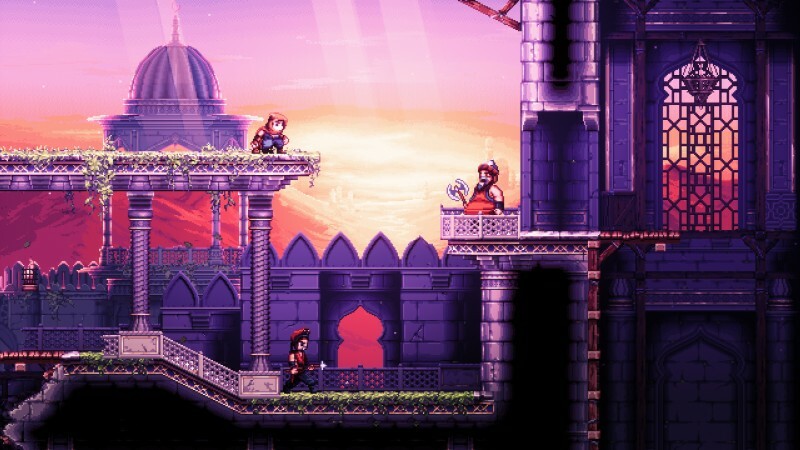 The atmosphere is rich thanks to the Sandfox’s blending of pixelated environments and modern graphical flourishes. Light creeps through open windows revealing dust hanging in the air, guards hold torches that light the surrounding area and leave a trail of embers, and phosphorescent mushrooms give off a neon glow. 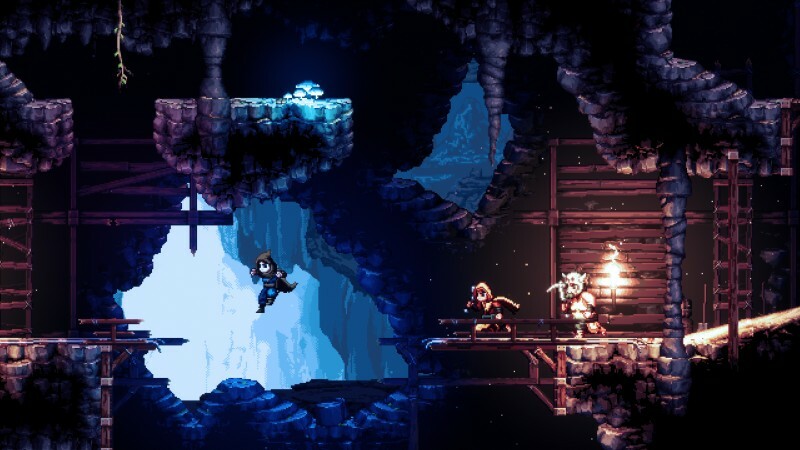 It all comes together with the game’s smooth character animations to feel more cohesive than you might expect from a pixelated world. 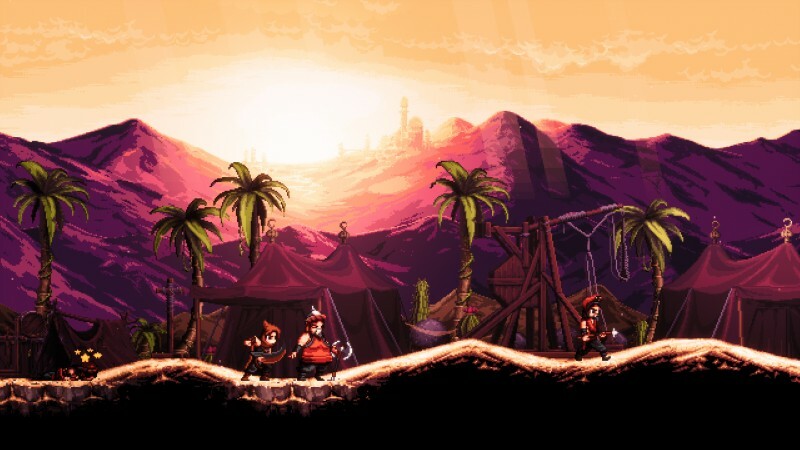 The Siege and the Sandfox is developer Cardboard Sword’s debut game. Its first attempt certainly leaves a strong impression, putting a stealthy twist on a well-worn genre. Instead of strapping a gun to your arm, you attempt to escape a cavernous prison with nothing but your wits to guide you – fortunately you are an experienced assassin, so your only immediate disadvantage is that you’ve been stripped of your tools. I quickly found helpful upgrades like lockpicks or a club to knock out nosy guards, which made me a dangerous, shadowy force. In my time with the game I didn’t get to see much variety in the enemies; most were simple, patrolling jailers who were easily dispatched. I came across several upgrades while playing, all appropriately significant. Finding the club meant I no longer needed to be as timid in my approach and could incapacitate foes. The climbing boots let me run up sheer walls, and the lockpick immediately had me excited to scour previously explored areas for all the doors I’d passed by. My time between upgrades was brief, but with no sense of the game’s length or how many upgrades are in the final version, it’s hard to say if that pace can continue. I enjoyed that momentum in my time at least. Crucially, the controls felt as smooth as the animation. Aside from figuring out some particular platforming nuances, the game never got in my way when I was exploring. Running around and up walls was satisfying and whacking unsuspecting guards has a nice, tactile feel. Everything from the combat to the navigation animated nicely adding to the layered world. I can’t wait to make a quiet escape when the game comes out. One of the more interesting aspects of The Siege and the Sandfox is its storytelling. You’re an assassin who has been falsely accused of murdering the king and are left to rot in the palace’s excessively large prison – and the story is narrated by a woman describing events as you play (similar to Supergiant’s Bastion). The narration adds gravitas to your actions, and lays the groundwork for an interesting and complex world full of larger-than-life characters that feel straight out of One Thousand and One Nights. I came away from my time intrigued by the setting and the player character and even more interested in learning about the woman narrating my escape. Since I wasn’t formidable in a fight, I needed to stick to the shadows to get by unscathed. This could be as simple as avoiding torchlights or enemy sightlines. You can hide in certain environmental objects like a large pot or empty crate to avoid enemies as they stroll past. Stealth was handled well in the game’s 2D environments; running with the right trigger will send out a visual pulse that lets you see how much noise you’re making. Enemies spotted me several times as I ran through an area, and when they did, it was game over. Unfortunately, The Siege and the Sandfox’s stealth loop is more generous than I prefer. Your character has nothing to defend himself in the opening minutes of the game, so you are forced to sneak and hide early on. Once you find the club – which unlocks a melee attack – the enemies became less threatening. Being able to easily knock out the enemies meant I only needed to hide long enough for them to turn around. Even then, there were a few times where an enemy was standing on a platform and when I would clamber up there, I would get spotted, but they would do nothing for several seconds. It removed the element of danger that was more present in the opening section. It often felt more like an action game where the enemies just let you attack them rather than a tactical stealth game. The Siege and the Sandfox is still in alpha, so much of this is subject to change. For how smooth the presentation is overall, though, it felt like I didn’t need to engage with the stealth as thoroughly as I would have liked. This could be attributable to either its early stage of development or perhaps the game gets more demanding further in. We’ll have to wait to find out. The Siege and the Sandfox does not have a specific release window and is currently only slated for release on PC. We looked at the game at GDC; here are our thoughts on the best indie games from the show. While we wait for more information, you can read our thoughts on another upcoming Metroidvania, Ori and the Will of the Wisp.